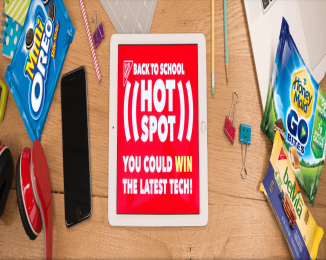 Nabisco Back to School Hot Spot Instant Win Game – Win a mini tablet! Win a Mini tablet (18 winners)! ENTRY LIMIT – Limit one (1) Instant Win Game play per email address/person/household per day. ELIGIBILITY – Instant Win Game is open to residents of the 50 United States (including D.C.) and Puerto Rico, at least 18 years of age or the age of majority in the jurisdiction where they reside at the time of entry. SWEEPSTAKES ENTRY PERIOD – Back to School Hot Spot (the “Instant Win Game”) begins at 12:00 am ET on June 6, 2016 and continues through 11:59 pm ET on September 5, 2016.